There is an ever-growing list of restaurants in Gatlinburg that I haven’t visited, but are on my radar to visit in the future. These restaurants have received my attention through social media, Trip Advisor, and by talking to the helpful locals, who know a thing or two about good food in their beautiful hometown. The rest of this post will focus on the businesses that I am anxious to visit. I have to admit I almost stopped here for lunch on my solo trip last August, but I reluctantly nixed that plan. This is a popular place that gets a little busy at times, but doesn’t get tons of tourist traffic, since they are located a few miles outside of Gatlinburg. They are your typical breakfast and lunch only business, closing in the early afternoon hours and serving up daily specials with atypical prices in a tourist location; more reason the locals love this place. They are also a top ten Gatlinburg restaurant, according to Trip Advisor. This restaurant was recommended by someone at my work that visits Gatlinburg fairly regularly. She and her husband ate here and were impressed by their portions and tasty food and said I should go. Actually, I have passed this restaurant on my visits to the Arts and Crafts Community — on the corner of Glades Rd. — and I am tempted to pay them a visit based solely on how good it smells driving past, and I am not even talking about the mountain air. Three Jimmy’s is a casual restaurant with pizza, burgers, steak, chicken, and ribs; so basically, you get a little of everything here, and the reviews say it is worth a visit, so I will plan on it. If any restaurant can make the claim as “a tradition” to describe it, then by all accounts, The Peddler lives up to this distinction. This is your traditional local steak restaurant that’s been in business for forty years and counting. Recommended by the same co-worker, this establishment also has a salad buffet, but the appeal is the atmosphere, and the employees carting out the steaks before ordering, so you can choose your own cut of steak you want to eat. It’s a bit pricey, but customers say it makes for a great romantic spot to have a quiet and satisfying meal; high on my priority list of places to eat, located in Gatlinburg by the River. Many people say it is hard to find good Mexican in Gatlinburg; in fact, many others say good Mexican doesn’t exist here at all. My family and I visited Loco Burro last June, and we were not overly impressed — not enough to return. However, I had a conversation with Lori — the owner of Farmhouse Home Goods, located at the Covered Bridge on Glades Road — and she highly recommended this place as THE place in Gatlinburg for good Mexican food. Along with authentic Mexican, they also provide live entertainment and a scenic outdoor patio for customers to enjoy. They are a short drive from downtown, located on the East Parkway away from the bustle of tourists. We plan on trying No Way Jose’s on our next visit, but won’t hesitate to come here if they disappoint. That is my short list of restaurants in Gatlinburg that I am itching to try, so if you the reader has tried any of these businesses, and want to impart your wisdom on them, feel free to explain in the comments why or why not I should pay these restaurants a visit. Thank you for reading and I will return soon for more Gatlinburg-related topics. I have family who like Three Jimmy’s, but I am sorry to say, we have tried it 3-4 times, and we haven’t ever liked it. Maybe it’s just a local thing, but I like to spend my dollars at a much better place. 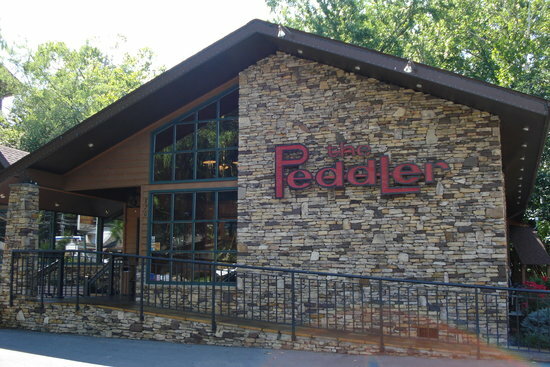 Now, if you haven’t tried the Peddler yet, you must go soon! It is SO good, and you will love their salad bar and steaks! If you save room, and it’s in season, you’ve got to try their blackberry cobbler, too! OH MY!! Be sure to ask for a table by the river, but honestly, I’m not sure there’s a bad seat in the house. Have you tried The Park Grill as well. It’s the sister restaurant to The Peddler, and it’s just as good, AND they are open for lunch. They went through a little slump there for a while, when they tried to “reinvent the wheel” in the decor and atmosphere; however, they’ve now returned to their original intent, and it is great. They have the same huge salad bar as The Peddler, and here, you definitely need to try the Black Bear Brownie Bash is to die for! …ok, sorry to take up so much space. Just thought I’d toss you my two cents worth on these restaurants. 😉 Happy eating!